The heavy range is mainly used for medium and heavy industrial demolition, building renovation, road construction, rock excavation and mining applications. They are rough, tough and built to last. 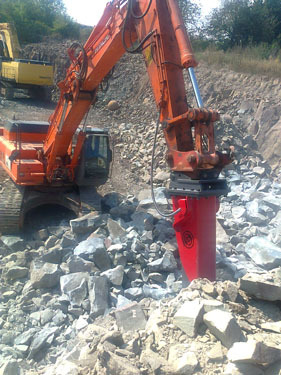 The smart design of the RX hydraulic breakers with few components and only two moving parts, offers a high grade of availability and reliability. Thanks to the RX recoil absorbing concept and the polyurethane insulated breaker box system, RX breakers are amongst the most silent breakers on the market and in line with the outdoor equipment directive 2000/14/EU. RX is a breaker that will handle the toughest jobs, in all weather - year in, year out. Some content copyright Chicago Pneumatic. Do not copy content without prior written permission.